This past Sunday I was kind of in a rut and had no idea what to make for dinner. Do you ever have days like that? I knew that I wanted something that would be warm, because of the cool weather and I new that it had to be easy. Finally I decided to make chicken, if you read my blog at all you will know that I enjoy making chicken on Sundays. I guess you could say that it is somewhat of a tradition. Fried Chicken really was very tempting to me, but I didn’t want to take the time to fry chicken. Then I found a recipe for oven fried chicken that sounded good. It was such a simple recipe I decided to try it. The chicken turned out to be delicious. It was nice and crispy, the flavor was wonderful, and we enjoyed it immensely. The only thing with all the frying going on in the oven, it did get a little smoky in the house. So it is a good idea to run a kitchen fan if you have one. I served this chicken with scalloped Hasselback potatoes. I will be posting the recipe in one of my next posts. 2. Wash chicken and pat dry with paper towel. In a pie pan combine flour, paprika, salt, and pepper. Coat chicken with the flour mixture. 3. Put butter in a shallow baking pan that is lined with aluminum foil and place in the oven to melt the butter. 4. When butter is melted, arrange chicken in the baking pan in a single layer, skin side down. Bake at 425 degree oven for 30 minutes, remove chicken from oven and turn over, return to oven and bake for addition 15 minutes or until chicken is tender and done. Looks good….. I grilled chicken thighs for dinner last night. I will have to try this one for sure! I love having an oven option for Fried Chicken. I hate the feeling, when I actually fry, of that oil just permeating my skin. I’ll try this, and be sure to use the fan. 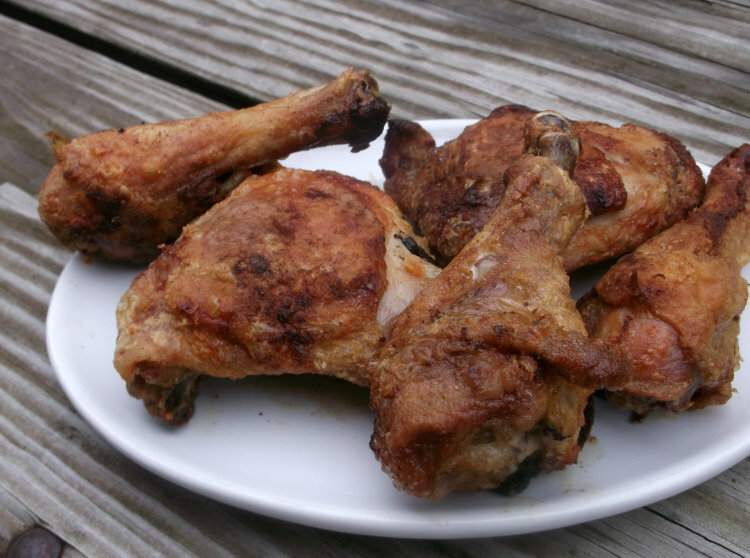 I love oven baked fried chicken… it always turns out moist and delicious without all of the guilt. 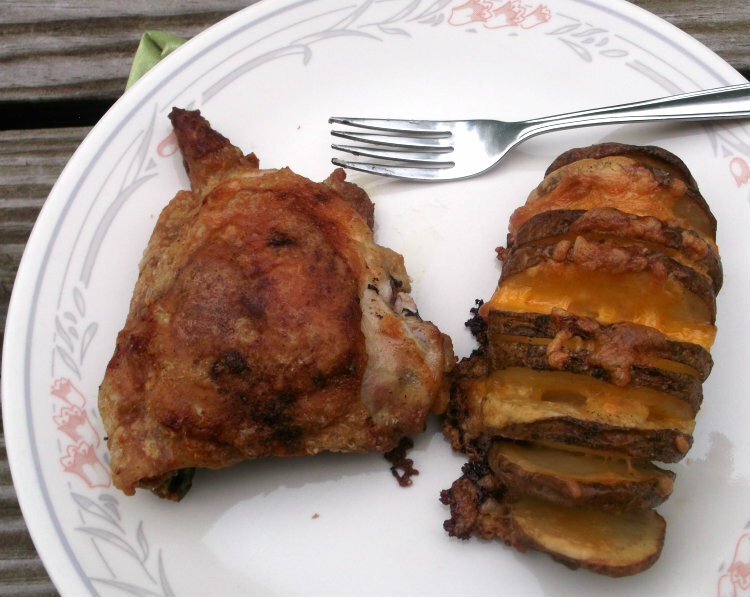 Looks really scrumptious … and the Hasselback potatoes Crown the meal – My husband taught me to do them – delicious! 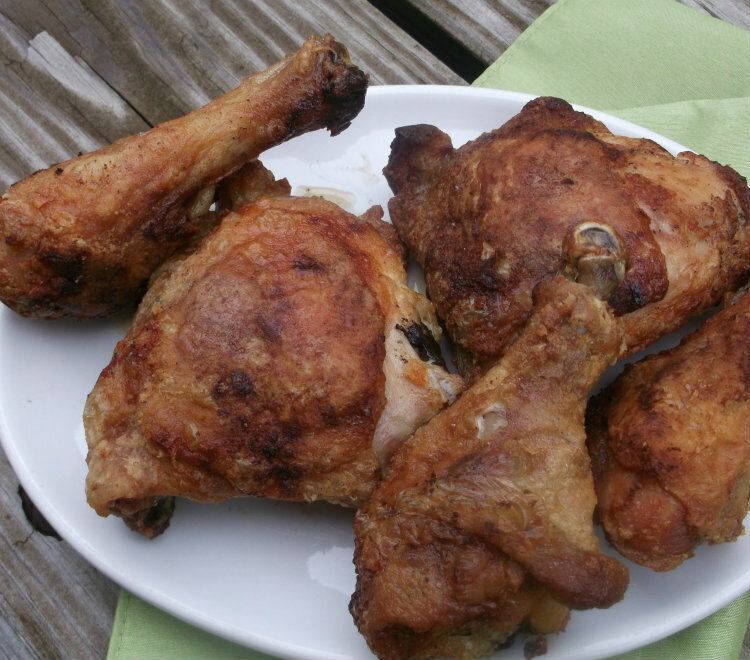 Oh, man….fabulous fried chicken without the mess! My family would go nuts for this!! !